Are you drawn to brand-spanking-new kitchens filled with drool-worthy high-tech appliances? Do you daydream about your “kitchen of the future”, filled with technology that will make your life easier and more enjoyable? World’s Fairs of the mid-century forecasted “Homes of Tomorrow.” These homes were described using words like "safe" and "sanitary". Kitchens in those homes may have revolved around the “miracles” of plastic or steel. But experts say today’s “Kitchen of the Future” should take into consideration that the kitchen has become a room where you spend time as a family and with friends. Sure, it’s the place where people cook, but they also hang out and talk there, do homework and play games as a family. The kitchen truly has become the central hub of the home. Richard Hughes, with Whirlpool Brand’s Connectivity User Experience, describes the futuristic kitchen as a place where, “All the important things in your life are coming together in the hub of the home—which is the kitchen.” With that, Whirlpool went beyond its traditional demonstrations of the kitchen’s cooking abilities, designing a Virtual Reality program that lets users virtually “step into” its Kitchen of the Future. You can try it at home if you have Google Cardboard or a similar virtual reality viewer. The experience includes the simulation of a potential “day in the life of someone caring for their family.” And with that come imaginative scenarios that use technology to anticipate your needs, make suggestions, give guidance and adapt to changing circumstances. Chelsey Lindstrom, Brand Manager at Whirlpool says, “The inspiration comes from how families take care of one another…and how we can better provide that care.” She explains that a team of specialists analyzed typical routines to further understand how a family of the near future will cook, clean and use their kitchen and home. One of the more dramatic concepts coming from the Whirlpool Global Consumer Design Group is the smart kitchen backsplash. In this future realm, it’s activated like a giant video screen—taking an area that the company says has traditionally been “dormant”, and turning it into an area that’s meant to be helpful to the user. For instance, a screen pops up telling the user what time a child’s school bus is set to arrive and letting them know whether there’s enough time to cook the planned breakfast. It realizes the user is running late—cued by the lunch bag having been placed on a cooktop sensor—and a list of alternative breakfast suggestions appears, based on items identified in the fridge or pantry. In the future, a smart induction cooktop could recognize the cooking utensils you use every day, and even the ingredients in them. And when it recognizes those items, it can pre-set the necessary settings to cook food at required temperatures. So a baby bottle will start warming up right away but not get too hot, or popcorn will begin popping almost immediately. The cooktop also senses the size of the pot, pan or vessel in use and works to heat it completely so food cooks evenly across its surface. An in-sink dishwasher is just that—a small dish-washing unit built right into the sink, that runs a small load for you. Perfect if you don’t want to do a standard sized load, if you’ve forgotten to put something into the regular washer and it’s already running, or there’s something that requires a bit of extra care. 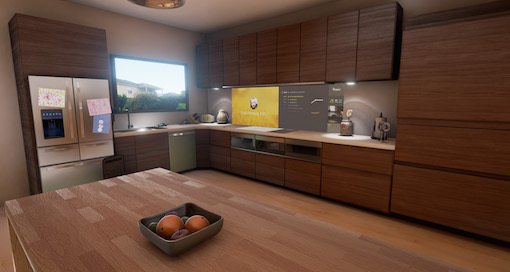 The conceptual kitchen is designed to learn the likes and dislikes of every household members, as well as their routines, so that it can “think ahead” and personalize everyone's experience. Using speech and image recognition, it keeps track of favorite foods, nutritional goals and makes recipe suggestions. For those who need it, the suite displays “cooking alerts” on the backsplash—for example, reminding the person cooking that it’s time to flip a pancake or quesadilla or stir the pasta as it comes to a boil.